Karla and I have been following each other on Instagram for a while now, and one day I got a DM from her with a photo of her showing off her brand new engagement ring. Eric had proposed to her in a field of sunflowers, and her immediate reaction (after YES! ), was asking if I would be their Boulder engagement photographer! We started planning an adventure session right away, and originally planned on hiking to a beautiful alpine lake in Indian Peaks Wilderness. However one of the “fun” parts of working as a Boulder engagement photographer is that the weather can be crazy unpredictable at times, and the day of Karla and Eric’s session was one of these days. As I drove up from Boulder to the trailhead near Ward, the temperature dropped by over 20 degrees, and I was met with a wall of thick clouds, heavy rain, and thunderstorms! It takes a lot for me to bail on a location due to weather. However this was one of those times where I knew Karla and Eric would be miserable if we went through with our original hike. 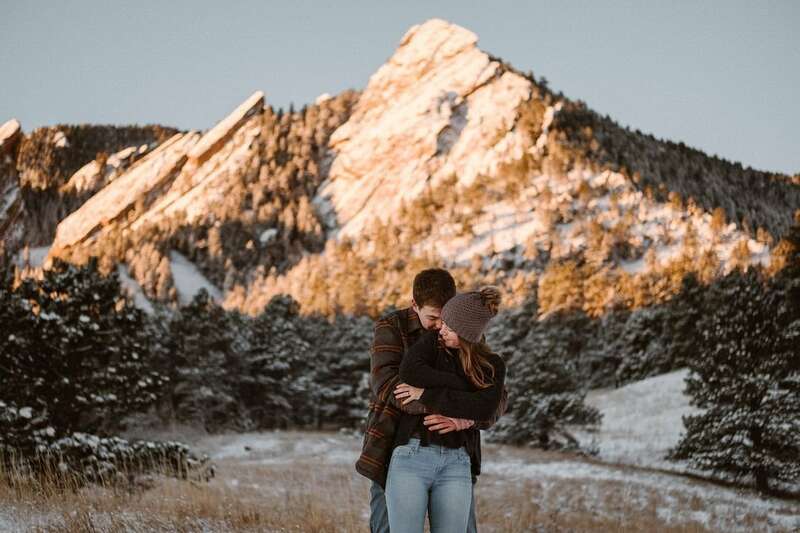 Luckily as a Boulder engagement photographer (and avid hiker) I know the local area well. I quickly thought about where else we could go closer to town where the weather was still beautiful, and we changed our plans around to this new location. As you can see from the photos, the weather in Boulder was beautiful that evening. We were only a half hour drive from the original trail, and you can actually see the heavy clouds over the mountains in some of these photos! Instead of freezing our booties off in the rain, we played around in grassy fields for an hour. Karla and Eric are so visibly in love that they made my job as a Boulder engagement photographer very easy that evening!